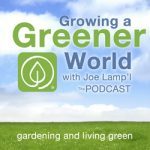 Growing A Greener World TV currently has three different garden podcasts to choose from (with a new podcast coming soon!). Click on the individual podcasts below to see the full listings and be sure to subscribe in iTunes so you don’t miss any future episodes. 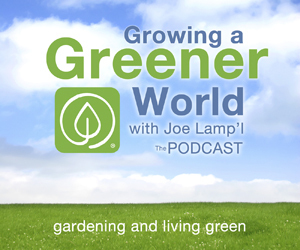 Growing A Greener World – The Podcast (Host Joe Lamp’l): This is our five-star rated marquis series from the TV show. Think of it as GGWTV on steroids. It is the backstory you never hear on the television side. Great interviews with some of the most compelling leaders and innovators in the organic gardening, green living, farm to table movement including: Maria Rodale of the Roadale Institute, Jeffrey Smith – the leading advocate against GMO’s and Peggy Miars – the CEO of OMRI. 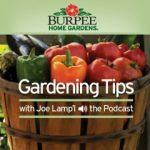 How Do I Grow THAT Podcast (Host Joe Lamp’l): Each episode takes you through the basics of how to grow a specific plant and keep it thriving. Everything from Artichokes to Zinnias are covered in this information packed show. Tip of the Week Podcast (Host Joe Lamp’l): This 26-episode series takes you through an entire gardening season of growing tips. From soil, organic pest control and mulch to end-of-the-season garden clean up, if you have a few minutes, you can learn a wealth of gardening information here.